As a little kid, I ADORED Julia Child. I could sit and watch her cook for what seemed like hours and truth be told, I still could . . . sadly I’ve tried to get my kids to watch, and they’re just not that into it. 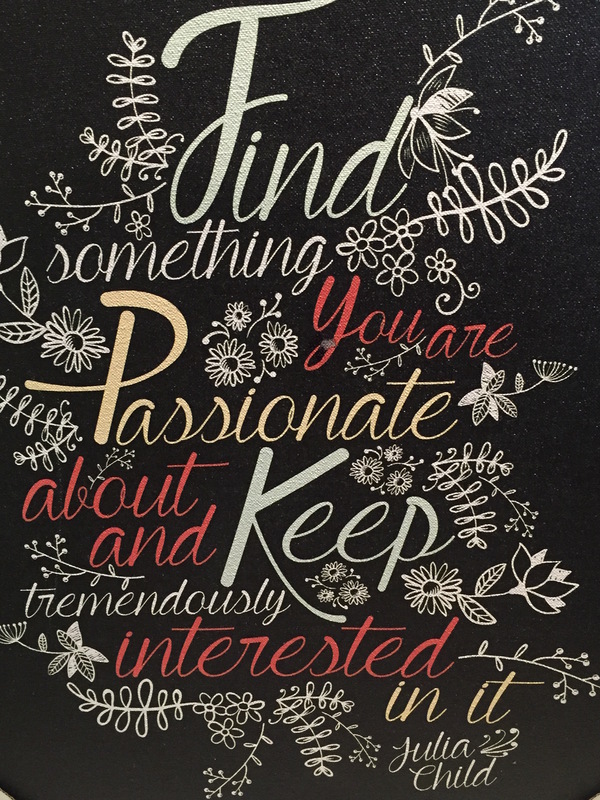 Anyway, I saw this, and figured it was exactly what I needed to hang in my office space; not just as a constant reminder to me to keep doing the things that I love, but also as a parent to keep encouraging the kids to find things in life that they are truly passionate about. Cream butter and sugar – I do this in my KitchenAid and I cream them until the mixture is really light and fluffy. Add in the eggs and beat again until everything is really well mixed. The secret ingredient that we then add in is a few chocolate chips – maybe about 1/3 of a cup in total. We use the Enjoy Life brand of chips. Divide the batter amongst the muffin cups and bake for about 30 minutes or until they are golden brown and spring back to the touch. While the muffins are baking the kids always get a little bowl with a few chocolate chips to “eat while the muffins are baking” . . . this just may be why they like making these so much! !